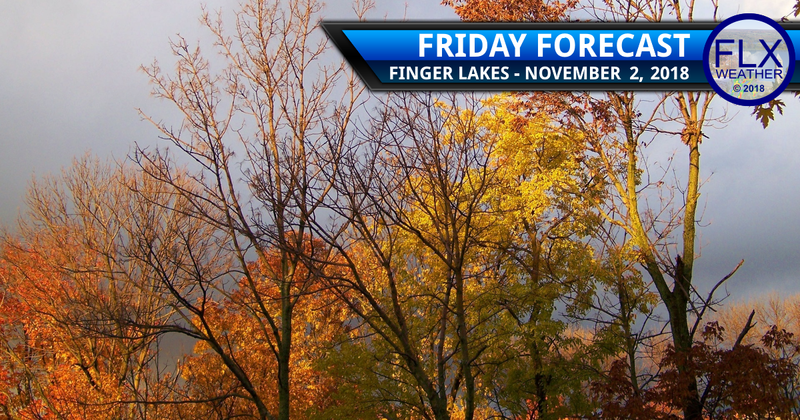 Depending on where you are in the Finger Lakes, it may be a cool day or quite warm. An area of low pressure is moving directly through the Finger Lakes, resulting in the clashing of air masses. Temperatures are well into the 50s this morning across the southern and eastern portions of the Finger Lakes. A sharp cut-off exists, with temperatures in the mid 40s just ten to twenty miles to the north. A band of heavy rain moved through the southeastern Finger Lakes early this morning and is moving into eastern New York. Scattered, lighter showers can be found throughout the Finger Lakes out ahead of the low pressure system. These showers should become less numerous as the morning goes on and low pressure moves through. I expect just a few isolated light showers from the mid morning through the late afternoon. Temperatures should rise over the southeastern Finger Lakes, possibly reaching as high as the mid 60s early this afternoon. Areas north and west of a Syracuse to Penn Yan line are unlikely to get into the warm air with temperatures holding in the upper 40s. By the late afternoon, the sharp gradient should dissipate with the northern Finger Lakes warming to the low 50s and the southeastern Finger Lakes cooling to the mid 50s. Cold air will work in from the west during the evening with most places in the upper 30s or low 40s by midnight. Some additional showers will be possible this evening before another lull overnight. Precipitation should increase again for Saturday morning as a new low pressure system tracks north through New England. The heaviest precipitation will remain to the east, but showers could become widespread for several hours before lifting out by noon. A few higher elevations across the Southern Tier and Central New York could see snow mix in. Much of Saturday afternoon will be dry with just a couple stray lingering showers. Strong west and northwest winds will develop with widespread gusts around 35 mph throughout the day. Gusts over 40 mph will be possible along the shore of Lake Ontario and into the higher elevations of Central New York. Temperatures Saturday will be stagnant, starting in the upper 30s and only reaching the low 40s. Clouds will break up Saturday night though a layer of thin cirrus clouds will develop for much of Sunday. With clearing skies and calming winds, lows Sunday morning will drop into the low 30s with mid 30s near the lakes. Winds will turn towards the south on Sunday, helping temperatures to bounce back to 50 degrees. The weather next week appears to be dominated by the approach, passage, and aftermath of another strong storm system. This low pressure will move northeast through the Mid-Mississippi Valley and Great Lakes. This looks like a classic fall set up, with the possibility for a major severe weather event throughout the Gulf States and Ohio Valley and some snow on the backside in the Upper Midwest. Here in the Finger Lakes, such a storm system often brings a surge of warm weather, followed by strong winds and a sharp turn to colder weather. Depending on the dynamics and timing, similar storm systems have produced squall lines with damaging winds. All of this looks possible, with temperatures Tuesday possibly shooting into the 60s with very strong winds. Early indications hint at the possibility of a line of heavy weather Tuesday evening. This will have to be watched closely over the coming days. Behind this system, a few days of below normal temperatures will be likely to end the week with scattered lake effect precipitation possible.